The Magic Lost Articles Fiber Spray English VCD. Doraemon is a popular and long-running anime based on the manga of the same name by Fujiko F. Fujio. Its best-known adaptation originally ran from 1979 until 2005, while a reboot, that began airing a month after the first series' conclusion, is still airing to this day. A total of 37 feature-length Doraemon movies have been released and numerous short films. At least three English dubs of Doraemon have been produced in Asia. One of them, the English Disney XD Asia dub of the movie Nobita's Great Adventure in the South Seas is available, the other dubs are lost. 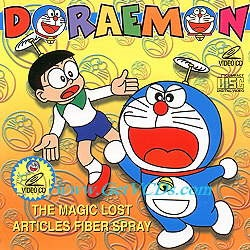 Various Doraemon episodes and movies were dubbed in English in Malaysia by Speedy Video and released on VCDs. Three of the VCDs have been uploaded onto the internet, the other VCDs are considered lost. The VCDs have been out of print for 15 years. Speedy Dub Gohan voices Nobita and Shizuka, Speedy Dub Oolong voices Gian, Speedy Dub Bulma voices Nobita's mother and Lilulu, Speedy dub Roshi would voice professor, and Speedy Dub Yajirobe would voice Doraemon and the Teacher. Titanic (37:24) and Dragon Ball Z (44:12 DBZ BGM-M1009) background music is used in Nobita Tetsujinheiden part 2. The voice actress Cindy Creekmore lists a Doraemon dub by the Singaporean company Voiceovers Unlimited for Odex on her resume. Caihui Lim was Japanese-English translator for the dub. Anime News Network lists Denise Tan Shu Fen as another voice actress for the dub.